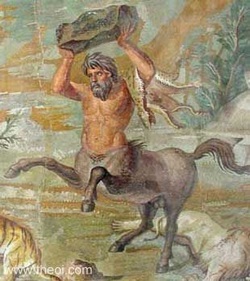 Half-horse, half-human, Centaurs first appeared in Ancient Greek mythology. They are caught between two natures. They may be wild and untamed as horses, but they are also as wise and brave as human teachers. They are often shown carrying Nymphs, when their wild side dominates. Female Centaurs, called Kentaurides, appear in later Greek and Roman myths.